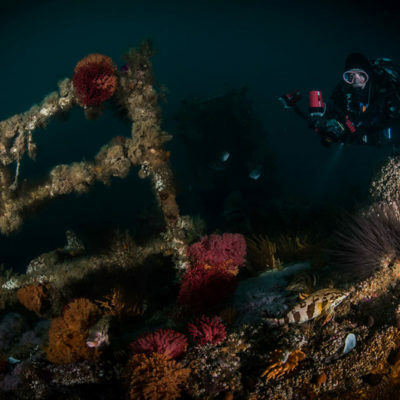 Our specialty is offering rare scuba diving opportunities with Seven Gill Cow Sharks and Spotted Gully Sharks in a magical kelp forest setting. 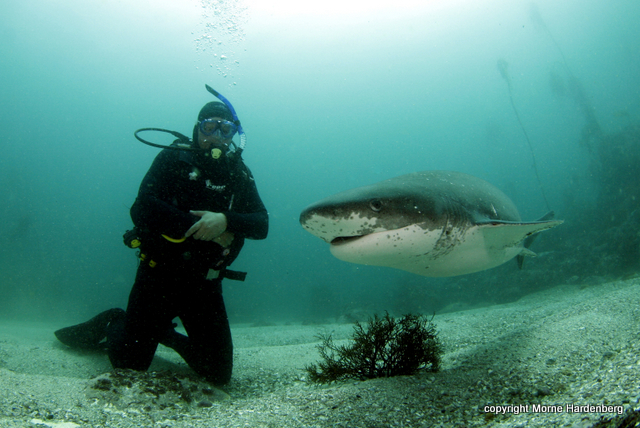 Cape Town is a rare place in the world where you can consistently dive with these rarely seen sharks. 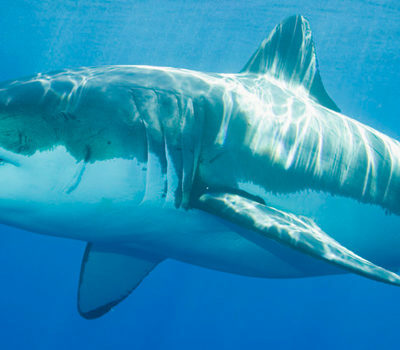 Seven Gill Cow Sharks are formidable predators of seals, other sharks and fish. They are called “wolves of the sea” because of their co-operative hunting behaviour – an extraordinary trait amongst sharks. What adds to the unique experience is because of their natural curiosity and confidence, we don’t use any form of chum or bait to interact with them. 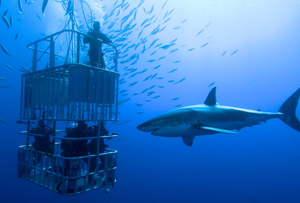 The sharks are found in between the kelp forests of Cape Town in a Marine Protected Area (MPA). This means the ecosystem is healthy and has an abundant variety of fish, shellfish and soft corals. The Seven Gill Cow Sharks are very curious and confident sharks. They swim slowly through the kelp or over the sandy channels between the kelp. They are social sharks and are often found in groups of 10–20. The size range seen by divers is between 1–3 meters. They will readily approach divers to get a closer look which means they swim right up to you and only turn at the very last minute. Close encounters are common. Location: Simonstown, Cape Town. South Africa. The Dive: Scuba advised, but snorkel possible. Two guided SCUBA dives (weights and tanks). Snacks & cool drinks on boat. A maximum of 8 clients can be taken at a time, but 6 are preferred. The inshore diving is a two tank dive (two dives of about 45-60min). We normally leave around 9am and return around 3pm. A 28ft catamaran with full cabin is operated (ideal for offshore and inshore).